Brookhaven Town has knocked down a trio of vacant North Bellport homes with a history of code violations. Officials said the houses, two demolished last week and a third torn down Tuesday, had been vacant and had a long history of violations for property maintenance and othgeer issues. “We can celebrate as yet another blighted property is removed from the community,” Town Councilwoman Connie Kepert, who represents the area, said in a statement referring to the second house. The homes were demolished under Chapter 73 of the Brookhaven Town Code, which provides a “fast track” to get rid of unsafe structures. Town Supervisor Edward P. Romaine said he wants to continue removing eyesores from North Bellport. “”North Bellport is plagued with a hihg number of vacant unsafe houses and we will continue to demolish them to help improve the quality of life in the community,” Romaine said in a statement. The address of the first house was 2 Anthony Street. Kepert said the second property at 955 Walker Ave.m, was once filled with garbage and other debris. 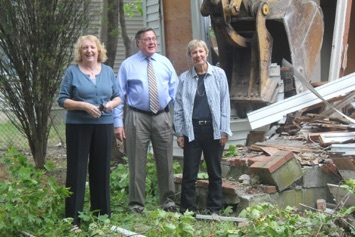 The home torn down Tuesday was at 547 Bellport Ave. In December 2013, the town created a vacant building registry requiring owners of vacant propertties to register with the town by providing contact infromation of the person responsible for maintaining the property. Failute to register within 30 days of vacancy could mean fines of up to $15,000, officials said. Last year, the town created a mobile application for residents to report vacant homes and commercvial properties. Residetns can go to brookhaven.org/vacanthouse to report the properties. 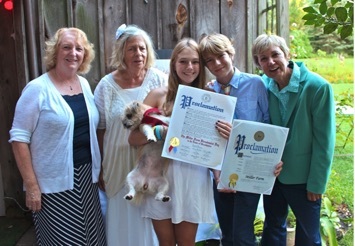 They can also call 631-451-8696, Monday through Friday from 9 a.m. To 4:30 p.m.
Farmingville, NY – On September 19, Councilwoman Connie Kepert and Suffolk County Legislator Kate Browning attended the Bicentennial Birthday of the Miller Farm House in Brookhaven Hamlet. The Miller family, Dr. Nathaniel Miller and his wife Sarah Haven, moved from East Hampton to Fire Place in 1815. The Miller Farm stretched from Beaver Dam Creek east to Little Neck Run. They ran an independent farm including a blacksmith shop and raised and trapped their own trout in the ponds on Beaver Dam Creek. Nathanial Miller was the third Postmaster of Fire Place in 1818 and served again in 1829 and 1849. His son, Nathaniel Miller Jr., also lived, worked, and raised his family at the Miller Farm and held various local official jobs, including Brookhaven Town Supervisor. His son, George Miller, worked the farm until his death. Decedents of the Miller family lived in the homestead until 1959 and several generations of the family are buried in the family cemetery not far from the house. 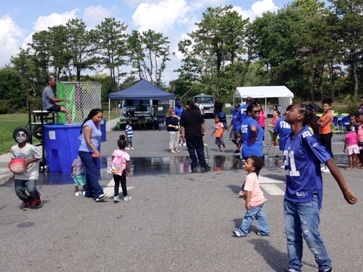 Farmingville, NY – On Saturday, September 19, Councilwoman Connie Kepert joined the Bellport Boys and Girls Club for its annual “Day for Kids” and Farmers Market. All produce sold at the event is locally grown on farms within 30 miles of Bellport. 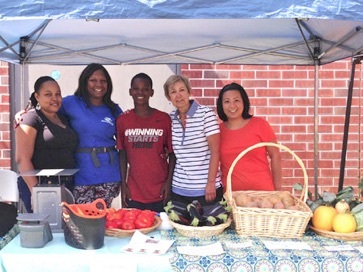 "The Boys and Girls Club "Day for Kids” and Farmers Market was both a fun and healthy day for kids and grownups," stated Councilwoman Connie Kepert. The market will be open every Saturday morning at the Bellport Boys and Girls from 11:00 am – 4 pm until the end of October. Types of payment accepted include cash, WIC, and Senior FMNP. 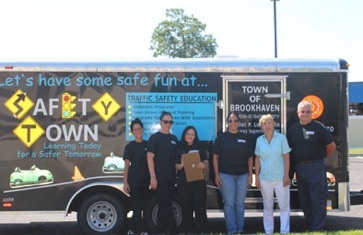 Farmingville, NY – On Friday, August 14, 2015, Councilwoman Connie Kepert and Brookhaven Highway Superintendent Daniel P. Losquadro partnered with the EAC Network and Coram Fire Department to host a free child passenger safety event at the Coram Fire Department. At the event, certified technicians provided inspections free of charge to ensure that residents had properly installed their children’s car seats. The technicians also provided essential information to parents about child passenger safety. 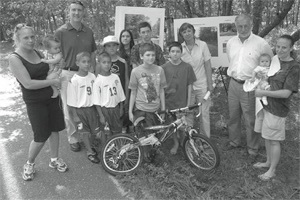 Funding for this program is made available through the Governor’s Traffic Safety Committee to fund road safety programs for local children.